Answer : (a) Preparation of soil : The preparation of soil is the first step before growing a crop. One of the most important tasks in agriculture is to turn the soil and loosen it. This allows the roots to penetrate deep into the soil. The loose soil allows the roots to breathe easily even when they go deep into the soil. The loosened soil helps in the growth of earthworms and microbes present in the soil. These organisms are friends of the farmer since they further turn and loosen the soil and add humus to it. Turning and loosening of soil brings the nutrient-rich soil to the top so that plants can use these nutrients. (b) Sowing: Sowing is the most important part of crop production. Before sowing, good quality seeds are selected. Good quality seeds are clean and healthy seeds of a good variety. Farmers prefer to use seeds which give a high yield. Nowadays the seed drill is used for sowing with the help of tractors. This tool sows the seeds uniformly at proper distances and depths. It ensures that seeds get covered by the soil after sowing. This prevents damage caused by birds. Sowing by using a seed drill saves time and labour (c) Weeding : In a field many other undesirable plants may grow naturally along with the crop. These undesirable plants are called weeds. The removal of weeds is called weeding. Weeding is necessary since weeds compete with the crop plants for water, nutrients, space and light. Thus, they affect the growth of the crop. Some weeds interfere even in harvesting and may be poisonous for animals and human beings. (d) Threshing: In the harvested crop, the grain seeds need to be separated from the chaff. This process is called threshing. This is carried out with the help of a machine called ‘combine’ which is in fact a combined harvester and thresher. 5.Question : Explain how fertilisers are different from manure. A fertiliser is an inorganic salt. Manure is a natural substance obtained by the decomposition of cattle dung, human waste and plant residues. 6. Question : What is irrigation? Describe two methods of irrigation which conserve water. water to crops at different intervals is called irrigation. The time and frequency of irrigation varies from crop to crop, soil to soil and season to season. Two methods of Irrigation which conserve water : (i) Sprinkler System: This system is more useful on the uneven land where sufficient water is not available. The perpendicular pipes, having rotating nozzles on top, are joined to the main pipeline at regular intervals. When water is allowed to flow through the main pipe under pressure with the help of a pump, it escapes from the rotating nozzles. It gets sprinkled on the crop as if it is raining. Sprinkler is very useful for sandy soil. (ii) Drip system : In this system, the water falls drop by drop just at the position of the roots. So it is called drip system. It is the best technique for watering fruit plants, gardens and trees. The system provides water to plants drop by drop. Water is not wasted at all. It is a boon in regions where availability of water is poor. 7. Question : If wheat is sown in the kharif season, what would happen? Discuss. Answer: Wheat is a rabi crop, which is grown in the winter season . Rabi crops are generally sown from October to March and rquire less water, low temperature, less humidity and moderate shunshine. Where as kharif crops are sown in the rainy season generally from June to September as these require a lot of water, excess tempreture, humidity. Therefor, If wheat is sown in the kharif season, due to entirely adverse climatic conditions it will not yield any crop. 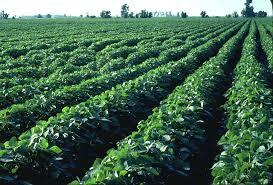 8.Question: Explain how soil gets affected by the continuous plantation of crops in a field. Answer: Continuous growing of crops makes the soil poorer in certain nutrients. Therefore, lateral farming of these crops, we have to add manure to the fields to replenish the soil with nutrients. 9. Question : What are weeds? How can we control them? Answer : Weeds : In a field many other undesirable plants may grow naturally along with the crop. These undesirable plants are called weeds.The removal of weeds is called weeding. Weeding is necessary since weeds compete with the crop plants for water, nutrients, space and light. Thus, they affect the growth of the crop. To controle weeds we can do the following things : Tilling before sowing of crops helps in uprooting and killing of weeds, which may then dry up and get mixed with the soil. The best time for the removal of weeds is before they produce flowers and seeds. The manual removal includes physical removal of weeds by uprooting or cutting them close to the ground, from time to time using a khurpi. We can also use a seed drill for the same. Weeds are also controlled by using certain chemicals, called weedicides. These are sprayed in the fields to kill the weeds. They do not damage the crops. The weedicides are diluted with water to the extent required and sprayed in the fields with a sprayer.